Here at Anatomy Chorlton we don’t just offer a range of physiotherapy and injury treatments. But we also offer a range of complimentary therapies to help you relax and unwind. These therapies will help you unwind from your day leaving you feeling amazing. 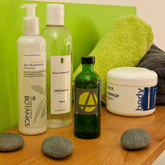 Holistic therapies should not be seen simply as an indulgence or pampering treat. Holistic therapies are extremely beneficial in everyday life as well as being useful for treating specific ailments. Holistic therapies aim to bring natural balance to your body by treating not only the physical body but also the mental and spiritual elements. Receiving a treatment can encourage and begin self healing, enabling you to gain a sense of well-being. In today’s fast paced society, our bodies can take a beating and disharmony is created – we need to stop, re-evaluate and be kind to ourselves. We need to take care of our bodies, minds and souls. Have a look through our list of treatments to see which one suits you best.